Custom built two story on a premium cul de sac lot in the prestigious Darien Club! Quality construction with full brick on all sides. Striking two story Foyer and dramatic staircase. Living Room and Dining Rooms have arched doorways and tray ceilings with white crown molding. Dramatic Two Story Family Room has a gorgeous floor to ceiling brick Fireplace. Open Floor Plan with Breakfast Room that has a triple sliding glass door w/transom that opens to the deck. Gourmet Kitchen with granite counters, stainless steel appliances and a huge center island. Hardwood floors in the Kitchen and Breakfast Rm. Full Bath w/shower on the main level. Large Laundry/Mud Room off the Garage w/a door to the back yard. Sit on the deck and enjoy the gorgeous lot with mature trees that provide peace and privacy! Fin basement w/5th BR, Bar and half bath. Luxurious Master Bedroom Suite w/whirpool tub and shower. Both furnaces replaced in 2016. New roof in 2017. New Carpet on the main floor and 2nd Floor. Gorgeous brick and cedar custom built ranch located on one of Downers Grove's most beautiful streets! Situated on a lovely 100x210 lot, this home has special architectural features like volume ceilings, wide hallways and skylights that make it open and bright. The impressive Family Room has a floor to ceiling Chicago brick fireplace surrounded by large windows, giving a view of the trees in the yard. The appealing floor plan has a formal Living Room and Dining Room, great for entertaining. The Kitchen has generous counter space, pantry and Breakfast Rm that leads out through the glass doors to the deck. Large hallway to the garage combines the functionality of a Mudroom and First Fl Laundry. Split floor plan has the Master Suite and two other bedrooms on one wing of the house with a Fourth Bedroom and private full bath at the opposite end of the home providing a perfect space for Nanny, Caretaker or In Law Suite. Walking Dist. to all three schools! Close to the Village Center & Train! Welcome Home!!! This Beauty Boasts 4535 Sq Ft Plus an Additional 3611 Sq Ft in the Basement All Nestled on More Than .5 Acre! Soaring Ceilings, Gleaming Hardwood Flrs, Gorgeous See Thru FP. Gourmet Kitchen w/Granite Counters, SS Appliances, Over-Sized Eat in Area Opens to a True Family Rm, 1st Flr Den All with Tons of Windows/Natural Sunlight & Gorgeous Views. Need a 1st Flr Master Suite w/Walk-In Closet? Perfect, We Have One Here. Enormous Updated Master Bath Boasts Knockout Soaking Tub, Separate Shower w/Bench, Double Bowl Vanity w/ Glass Bowls. Pocket Doors Provide Open Flr Plan & Privacy As Needed. Total of 3 Bedrooms On Main Flr Plus a Den(Sun Rm Or Office? You Decide) w/Pocket Doors. 2nd Flr Boasts Loft, Full Bath & 2 Addt'l Bedrooms. Full Basement-Finished Area w/Workout Rm, Pool Table, Sitting Area w/FP & Rec Rm, Roof 2012, Quiet Street, Tons of Storage in Basement & Full Attic(Potential to Finish)! 80x11 Deck. Close to Park, Schools, IBC University, Metra & Downtown. HURRY! Lovely, charming home in pierce downer! This home has been loved and maintained throughout the years. Fabulous block and 60x250 lot. Enjoy quiet backyard from screened porch. Home was expanded years ago to add larger eat in kitchen, master bedroom w/full bath & walk in closet. Hardwood floors on both 1st and 2nd levels. Walk to town/train/all schools & park. Very sought after location! Exterior was painted within past 5 years. Very comfortable home. 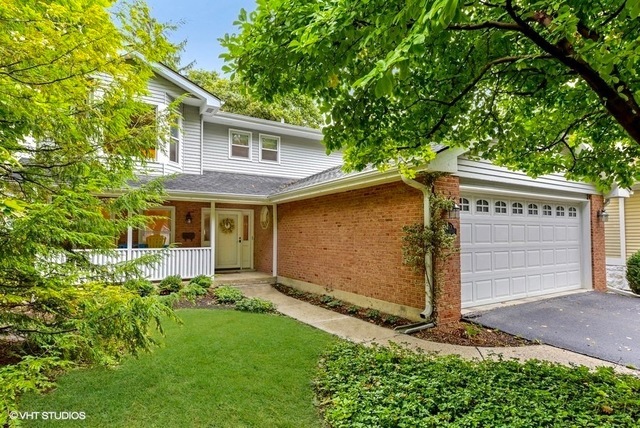 Located in the exclusive Denburn Woods, this 3 Bedroom north Downers Grove ranch sits on a nearly half acre private wooded lot. From the paver walkway leading to the quaint front porch, step into the welcoming foyer and see all that this home has to offer. Larger than it appears, this well-maintained home has an open kitchen-family room leading out to a large, private paver patio. The two fireplaces, crown moulding and hardwood floors add to the charm of this lovely home. Huge basement ready to be finished, offers endless possibilities. Perfect opportunity for buyer needing a ranch in a great location. Short walk to downtown Downers Grove, train station, parks and schools. Beautiful neighborhood! GREAT OPPORTUNITY!!! Looking for A Five (5) Bedroom, Full Finished Basement w/ an expansive backyard? AND HAS OVER 3900 SQ. FEET OF LIVING SPACE that shows like a MODEL?? ... Stop Right Here! The Private entryway leads you right into a soaring 2-Story Foyer w/ gleaming Hardwood Floors, 12-ft Ceilings, and a Formal Dining Room. Not to mention the beautiful Living Room w/ abundant Natural Sunlight. An Open Family Room & Gourmet Kitchen w/ 42" Maple Cabinets & SS Appliances overlook the Exquisite Backyard that is Perfect for Entertaining. The Private-Tiered Decking is surrounded by mature landscaping that offers Spectacular Sunset Views with a Cozy Fire-pit. All of this will allow you to enjoy this space all year long!!! The 2nd Floor accommodates a large master suite w/ a gorgeous Bath while the Lower Level extends to a Full Finished Basement complete w/ a Full Wet-bar, Saltwater Fish Tank, and even a Large Guest Bedroom Suite with a Full Bath... Don't Miss it !